There is a different dynamic to Bologna. It is a college town so you will find a lot of younger people here. The restaurants and nightlife are different than the other cities we visited. Not worse, not better, just different. I actually really liked the feel. It was the perfect transition from the sleepy city of Venice. This was a little more lively, still with the old buildings and cobblestone streets. It was not in your face like the bigger cities would be and felt very relaxed and casual. We were told by several people how "old" the city was and they were right. Modern civilization has built itself up, in and around these majestic ancient buildings and it is fascinating to see. There is the historic center with Piazza Maggiore that acts as the beating heart of Bologna with various piazzas and narrow roads (veins if you will) intersecting and filtering outwards to the countryside. Once getting to the center it is fairly easy to navigate as everything is in close proximity to each other. Today Allen and I were able to view all the landmarks we had planned and prepared for (with the exception of one) and even came upon some surprises that we didn't expect. The first surprise was walking into Santa Maria Della Vita church and happening upon an exhibit of terra cotta sculptures depicting the death of Christ. Somewhere between 1465 and 1490 artist Niccoló dell'Arca created this group of 7 statues larger than life size and are consisting of a dead Jesus Christ laying down and 6 people surrounding him (the Virgin Mary, Mary Magdalene, Mary of Salome, Joseph of Arimathea, Joseph the Evangelist and Mary of Cleophas). The paint has long since worn off but the statues remain in tact and the expressions and feelings conveyed on the faces of these statues was incredible to look at. Another highlight of our day was walking through the open markets of Bologna. There are 3 streets connecting to each other that are full of little shops, flower stands, meat markets, wine bars, bistros and gelato stands. I had seen a picture of this area months ago and until today seemed like this dream to visit. It was a little surreal when I turned the corner and saw what I had been looking at on a computer screen for so long now displayed in REAL LIFE in front of me! This was officially what I can only describe as a "travel moment". I had purchased a ticket, packed my bags and drooled over my keyboard waiting to see this sight. It did not disappoint. Walking by all these gorgeous looking markets and food stands we were feeling the need to stop and take it all in with the help of a little wine and cheese. 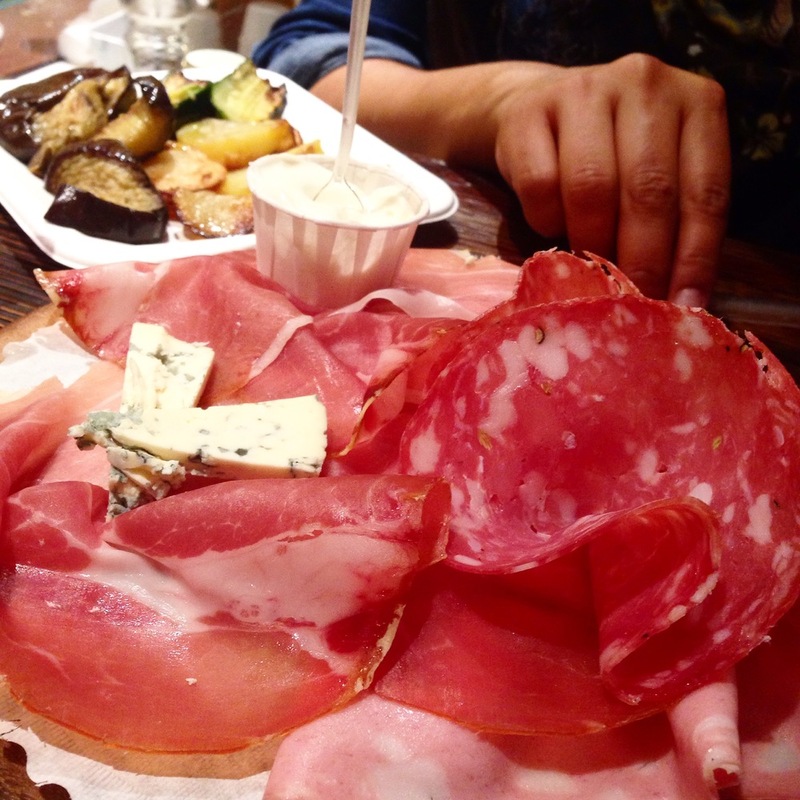 We happened into this cute little antipasti, cheese and charcuterie cafe and had some cured meats, cheese and antipasti (roasted eggplant, zucchini, potato and *ahem* meatballs - this is Allen and Italy after all!) for lunch. The staff was very friendly, one gentleman in particular who's English was better than the rest and we got to talking about California and what I did for a living. Once we were done eating he presented me with a cheese board as a "gift to my friend". I was more than touched. This little gift and gesture are priceless in my book. I will forever be grateful of the kindness of my Italian cheese monger.